Tok...the only way in or out of Alaska from the ALCAN. Excellent RV park with a staff that takes the upkeep and maintenance seriously. Definitely far above the average RV park. Clean laundry, clean restrooms, excellent office staff and gift shop. Recommend two nights going in and coming out. Also recommend reservations made in advance. They get full often during the summer season. Stayed June and July (up/back fm Alaska). Sites plentyful and sufficient spacing for full slideouts (both sides). Caravans placed at separate section however, when they arrive first thing is highway speed around 300 section for Class C and 5th wheels (dust, noise) to wash site ($12 for 45 min). With caravan of 20 rigs, takes a while for all to cycle through two wash pads. Family run site well-kept. Must stop spot. Great first stop in Alaska! Friendly staff and they greet you at registration with fresh baked cookies. Adequate sites, clean laundry facility, and allow camper and tow vehicle washing for a fee. Discount given on gas. Stayed both on our way through and our return trip. Thank you for your lovely campground. This is a pricey park, we paid $50 for pull-thru full hook up. Restroom/showers are clean and fairly new. Showers are free. RV sites are not too close together. There are trees so some shade. Except for the price, this is a really nice park. I might stay here again if I could not find a comparable one for less money. The sites are gravel and mine was not level. 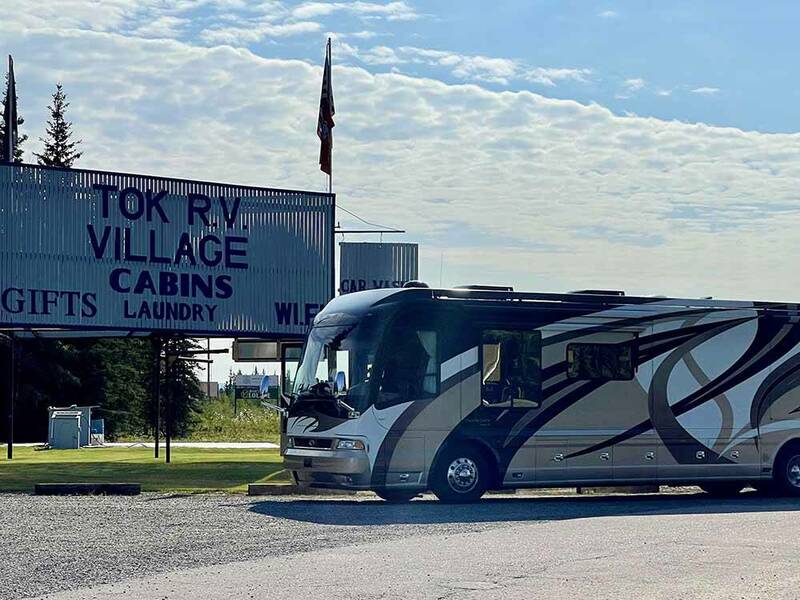 We really like family owned parks like Tok RV, they always feel more like home. The pull through site was easy to get into and the exit was easy to maneuver. The staff was friendly after our long trip through Canada so we were really happy to spend two nights there getting caught up on our laundry. The washers and dryers were nice and clean and they have Wifi throughout the park so you can bring your laptop to the washroom. We didn't take advantage of the showers they had on site but I did notice they were nice when using the restroom. Looks like they have cabins for rent as well. Hard to beat this place right off the Alaska Highway. This a large park with the majority of the spaces being pull thru's. Our site was gravel and level front to back, but not side to side. While our site had ample length to accommodate our MH and toad, the trees between sites made positioning for extension of the slides tricky. Our site was full hook ups with 50 amp service and all utilities were fine. The laundry was very clean and with 7 washers and 6 dryers we were able to get our loads done quickly. They only provide 1 hour of free wifi per day of stay, but they need to be clearer in the wifi instructions that the purchase of additional time is still limited to a max of 250 mb of data and once that is reached you are bumped off the network irregardless of how much time you purchased. Very busy, grumpy host. One hour free WiFii (per site) - and you are cut off at 100MB. Why don't they say that - pretty expensive with no WiFii $49 with discount. Definitely a good place to stop if you're in Tok. Sites are well spaced, restrooms were clean. Owners are very friendly, don't forget to grab a cookie at check-in. Lots of room to walk around and relax after a day of traveling. We only stayed a night so we didn't have time to check much of the surrounding area. Would stay again.